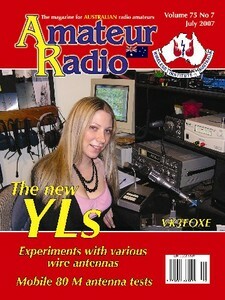 July marks the birthday of ALARA (Australian Ladies’ Amateur Radio Association). We have taken the liberty of celebrating “new” YL (Young Lady) operators on the cover and Inside Back Cover of this issue. In addition to the usual ALARA column in the “News From” section of the magazine, we try to include additional material with a YL focus in the July issue. So, we have a feature on two prominent ALARA members, together with a poem written by Christina VK3FOXE, who appears on our cover. All members of the Publications Committee thank members who have replied to our request for information of delivery of AR magazine. The information has proved to be most informative. At the time of writing, we have enough responses to give us an idea of delivery times across the nation. In order to be even more useful, we ask you to again forward the information for this issue of AR and the next two issues. You will see a reminder on the ﬂy/cover sheet which has your address details for the copies of AR mailed to subscribers. For the next three (3) issues, please continue to send an email to ar_ delivery@wia.org.au with the details of your callsign, your postcode and the date of delivery of AR in the body of the message. “Subject” can be a simple message, such as “July delivery”, even just leave the body blank and include the required details as the “Subject”. It appears that this month has a lot of Contest news. In addition to the usual Contest column, we have the Results from the John Moyle Memorial Field Day Contest, thanks to Denis VK4AIG/ VK3ZUX. These results arrived just in time for the last issue of AR, but we would have needed to remove some other content to include them. Therefore, they appear this month, despite the fact that they have been available via the WIA web site for most of the last month. We also have the Rules for the Remembrance Day Contest and for the ALARA Contest, both occurring in August. Also, for August, do not forget the International Lighthouse/Lightship Weekend. August is looking like a potentially busy month of activity. Now that we have gone past the middle of June, the frequency of “ham fest” type activity declines for a couple of months. Whilst we still have the occasional event, it seems that winter is less preferred for this type of activity. We have the GippsTech Technical Conference held in early July at Churchill (without the commercial traders), the Gippsland Gate ARC event two weeks later, and an event in VK6 on the ﬁrst weekend in August. It is then a gap until such activity resumes at the higher pace seen through the spring to autumn period. I am sure that the major manufacturers appreciate the relative pause in the pace of activity. I must admit, wearing another hat as the Chair of the GippsTech Organising Committee, the lower frequency of events, and lower level of VHF/UHF and above activity, at this time was part of the reason for holding this event in the middle of winter. Hopefully the event, on July 7 and 8, will be (or will have been) a success. One of the articles this month reports some interesting results from tests of a variety of mobile antennas for 80 metres. The challenge for us now is to convince the author to inform us all of the details of the winning antenna. Please continue to make your contributions to the magazine. Just remember that our review and preparation process can be slow, so it may be several months before your technical article appears in print. News items usually appear in the next issue, provided that the material arrives by around the 6th of the month preceding. 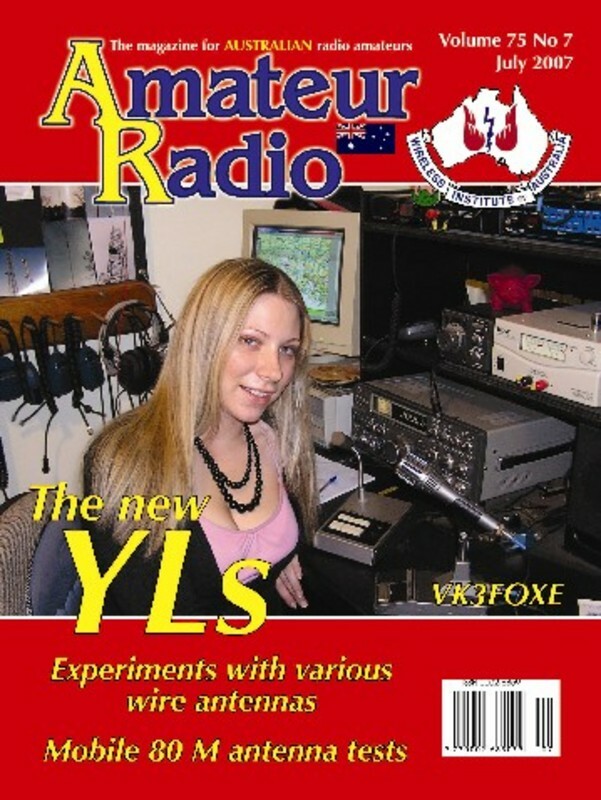 As it coincides with the birthday of our national women's radio organisation - Australian Ladies Amateur Radio Association (ALARA) - it is traditional that the July issue each year includes articles that focus on ALARA activities and members. This year, Christine delivers outlines of Shirley VK5JSH and Dot VK2DB. We also have an original poem by Christina VK3FOXE, who also features on this issue's cover. On the inside back cover, we have a short item on the updated ALARA Award. The Women in radio article is available for download below. With the advent of the Foundation Licence, there has been an upsurge in amateur operators teaching classes in the theory and practical levels of the new licence and indeed there is also an apparent increase in 'upgrade' classes being taught in many clubs and centres. VK2KE was a radio and electronics teacher/trainer in the 1980s and ’90s and has compiled these tips on how to make the teaching and learning exercise more efficient and enjoyable for all concerned. Grant describes his work on the construction and commissioning of a simple regenerative receiver. It shows that it is not too hard to build something that is useful in the shack. This article is available for download below. Don outlines a series of tests conducted by a group of friends to move from opinion to quantitative data on the performance of several mobile whip antennas used on the 80 metre bands. The results are most interesting and some antenna owners were rather surprised at the poor performance of their antenna.